A couple weeks ago, I tried making a batch of homemade ravioli. I used a DK Pasta book (I know, I know, that already should have been an indication of sure failure) for the dough recipe. It asked for 300g flour and 3 eggs. To cut a long story short, let’s just say that the recipe was far from perfect. Not only did I have to throw in a lot more flour, but the process outlined was quite a bit off the mark. In the end, while the filling was yummy (duck sausage and foie gras), the pasta dough could have been much better. My brother’s girlfriend J, who made the amazing pappardelle I rave about in an earlier post (Cooking with Truffles), recommended I try Paul Bertolli’s recipes. So, this weekend, my wife and I gave pasta making another shot. Stupid and stubborn as I am, I didn’t turn to Bertolli first. Instead, I tried a recipe from Marcella Hazan–after all, she is supposed to be the grandmama of Italian food. She asks for 200g flour to 2 eggs. Maybe this works in Italy, but in a hot, humid climate like Singapore’s, all I got was a sticky mess. So, on to Bertolli, who recommends 280g flour, 2 eggs and 1 tablespoon of cold water. Et Voila! As predicted by J, perfect pasta. Here’s some pix of the wife rolling out the pasta and balling it up for drying. The only challenging thing, we found, was (in our climate) ensuring that the fresh pasta, when drying, wouldn’t stick together. We had to dry it a little, and then when the stickiness was gone, roll it up and let it dry some more. Unfortunately, we left the pasta to dry on our dining table and a while later, when our backs were turned, we discovered one of the rolls on the floor with our ever-greedy golden retriever Sascha chomping on it. Fortunately, Sascha had only eaten one of many rolls. Over the weekend, we finished off the rest, using one batch for Carbonara and another with some homemade pesto. 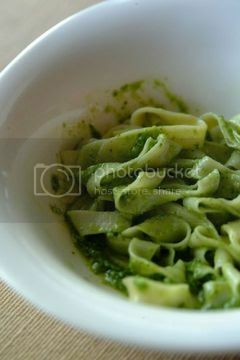 I’ve included a photograh that I like a lot of the pasta with the pesto sauce at the very beginning of this post. You can click on it to see a larger version of it. I have been itching to make fresh pasta but I'm not sure what flour to use as some books say plain while others say use Italian flour which I cannot find in KL. Your pasta looks good, can you tell me what flour you use? I’m a little embarrassed to say it but when was out looking for french kissing tips information I found your post: Making Pasta and had to stop for a read. I sicerely appreciate you blog topic… I’m considering making a blog about french kissing tips and I should probably stop by here more often to watch how you do this great job.. I always love looking through other poeples blogs and reading the posts (especially yours!) I don’t know if you like other blogs or want to check out mine, but I think you’ve done a quality job. It’s great to be here on your blog, thanks.